Cities are facing overcrowding issues all across China, and in tandem with recent problems related to climate change, the country is quickly looking for solutions. One potential way to address these environmental issues pertains to the development of eco-cities. EC-Link outlines joint European-China efforts to implement a sustainable low-carbon city-based solution to ecosystem issues across China. China’s recent interest in developing eco-cities is part of its larger move towards low-carbon development, with an aim to mitigate climate change and prevent the collapse of already crowded mega-cities racing towards their population ceilings. The Europe China Eco Cities Link (EC-Link) project is funded by the European Union with its main objective to support Ministry of Housing and Urban- Rural Development (MoHURD) in implementing a sustainable low-carbon urbanisation agenda. The project is part of the EU-China Urbanisation Partnership, launched by President Barroso and Premier Li in May 2012. 1. The demonstration of best practice approaches towards implementing low-carbon solutions is one of these projects. Best practice low-carbon solutions will be identified and made available. Toolboxes are developed based upon European and Chinese eco-city practices. 2. The creation of innovation-based testing grounds, should occur in the following nine sectors: compact urban development, clean energy, green buildings, green transportation, water management, solid waste treatment, urban renewal and revitalization, municipal financing and green industries. 3. The project also supports the establishment of ‘knowledge networks’, so-called CNUs (City Network Units). In December 2016, MoHURD and EC-Link arranged a series of workshops across several sectors. These workshops revealed a broad Chinese interest in how European cities have organised themselves to more adequately address environmental challenges and to enable comprehensive city planning and operations. These and other key topics were discussed in Xixian, an hour’s drive from Xi’an’s city centre, in early June 2017 and in Zhuhai late the same month. The EC-Link workshop in Xixian/Fengxi New Town, on 6th-7th June, was focused on green construction. The goal was to dive deeper into the various opportunities and challenges associated with green building methods and solutions that might be interesting for China. One much discussed topic was energy passports for buildings as part of a larger initiative to classify and measure their energy efficiency. 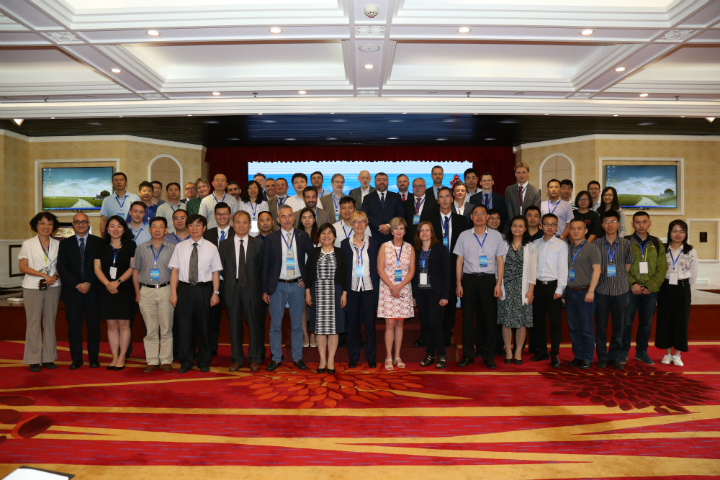 In another workshop in Zhuhai, from 21st to 23rd June, numerous European city representatives were invited including Barcelona, Dundee (Scottish Cities Alliance), Hamburg, Liverpool and Valencia. Many European initiatives were presented ranging from multi-national central European directives, such as the Energy Performance of Buildings Directive (EPBD) to local municipal actions. EC-Link is not just pointing out European good practice examples for Chinese city representatives but also attempting to provide them with sufficient context to understand the magnitude of what a successful European solution can do. How is this relevant? China’s cities are bracing themselves for continued domestic population growth, which includes an additional amount of housing that accountant for as many as 300 million people. Providing sufficient housing is an enormous challenge, with a litany of other issues that stem from a population increase including resource consumption and a stressed urban transportation system. Integrated planning and less resource intense buildings can yield huge savings, lower pollution levels and prevent urban areas from collapsing. Many Chinese cities are pushing ambitious green agendas, as is the case in Fengxi New Town and Zhuhai. Local representatives are passionately presenting new building projects such as geothermal pumps. Interest in European products and expertise is still high on Chinese cities’ agendas. Challenges faced by Chinese municipal leaders and institutions are significant. There are still many cooperation opportunities for European companies and institutions with Chinese cities. How is EC-Link bringing together cities? One vector is through city network units (CNUs) which were first implemented in the past two events held in Xixian and Zhuhai and are intended to be used in upcoming events. Cities are grouped by common interests and are given opportunities to exchange on those subjects. European experts provide sufficient context to help them make sense of what other cities are presenting. Bringing cities together is challenging. Each city can be considered an ecosystem and different cities are facing different challenges. Cities all need to prepare for climate change, and make their infrastructure resilient to its often-disastrous effects, such as severe flooding. For instance the concept of a sponge city, a permeable city where water can be absorbed before it can accumulate enough to become a problem, is an innovative concept that could be applied in cities across the world. EC-Link is funded by the European Union. In cooperation with the Ministry of Housing and Urban-Rural Development (MoHURD). The project is implemented by a European consortium led by GIZ and the Chinese Society for Urban Studies (CSUS). The EC-Link team is located in the offices of the CSUS. The views expressed are those of the team and do not necessarily reflect those of the European Delegation or MoHURD. Feel free to write to them directly at eclink@chinasus.org. Share the post "EC-Link Opportunities"